When designing a robot buddy for students, you’d think the more realistic looking the robot, the more appealing, right? Not so, says academic-turned-entrepreneur Laura Boccanfuso. The current version of Boccanfuso’s robot, named Abii, is a modernized throwback to the tin wind-up robots of old and features big circular purple eyes set in a white oval head and claws for hands. Boccanfuso first dreamed him up as part of her quest to help educators figure out a way to provide all students in a classroom the same amount of educational stimulation and help. “Teachers today have to teach to the middle because today’s overcrowded classrooms have a variety of different learners but still only one instructor,” she says. “So I wanted to help create a solution that was scaleable.” Thus Abii, the robot tutor, was born. Boccanfuso first became interested in computer science over a decade ago, earning a Ph.D. in computer science (with a focus on human-robot interaction) from the University of South Carolina and an MS in computer science (with a focus on artificial intelligence) from Bowling Green State University before that. As part of her research, Boccanfuso spent 10 years in the field working with clinicians and learning how to really engage students with new materials. What she learned was that the best clinicians were continually monitoring and adapting to kids’ stress levels—especially those that were on the autism spectrum or had developmental issues and ADHD. They then used that information to develop prototypes for human-robot interactions. However, as someone with a more pragmatic streak, Boccanfuso knew that many of these academic prototypes she was observing were unlikely to ever hit a real marketplace. So she founded Van Robotics and built Abii with the help of a mechanical engineering grad student. She also successfully applied to Techstars Austin’s accelerator program to be in their Spring 2018 cohort. Since officially launching last year, the company now has eight prototype robots, 22 lessons for the robot to teach (all in math), and are currently in the midst of launching their first pilot to help empirically validate the product and learn what other use cases could be. As part of the pilot, they will be visiting schools in Alabama, Kansas, New York, and South Carolina. Abii is fairly simple to operate, says Boccanfuso. Students turn the robot on and then navigate to a pre-assigned url on a desktop computer or laptop (a mobile screen would be too small to be useful). The robot then takes over the screen and leads the user through a customized program that tests students’ knowledge, gives them a specific lesson, and then does a final assessment. 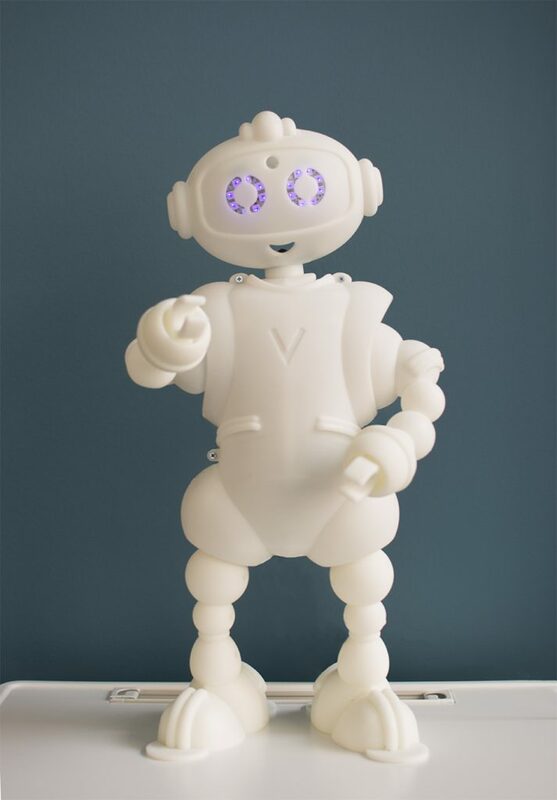 If during the lesson, the robot notices the child’s stress levels are going up, the robot will offer the child a break or a game to play, explains Boccanfuso. If they notice the child’s attention is waning, they can call them back to the screen. “The robot uses machine learning to learn individual patterns and how it correlates to each specific student,” Boccanfuso says. Eventually, Boccanfuso hopes that Abii can be used beyond K-8 applications, which is where she is currently focused. In particular, she’d love to see him integrated into after-school programs or at YMCAs, or even eventually in hospitals, where he could interact with patients suffering from Alzheimer’s disease or dementia. “The next generation of robotics is going to be interacting with society in really sophisticated ways,” says Boccanfuso, though she cautions that “the socially intelligent robot is still a far ways off.” In the meantime, however, she and her colleagues plan to maximize what’s available in the world of robotics to improve the learning process for students as much as they possibly can.